23 Years Later and I finally finished what I started.. It took 23 years to get there but I finally finished what I started. 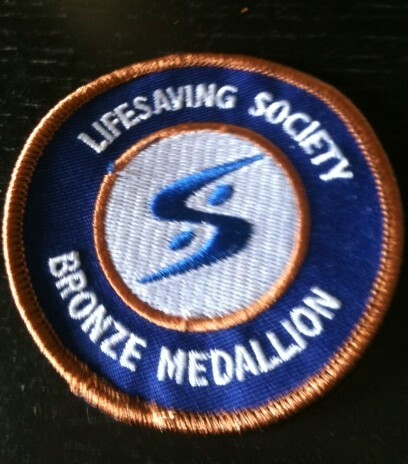 I am pleased as punch to report that I passed my Bronze Medallion final exam yesterday and received the elusive Bronze badge and medal that I had originally started going for when I was 13 years old. and now the question I have gotten ALL the time? WHAT possessed you to go and sign up for a class where you are older than even the teacher by 20 years, get to hang with the 11-14 yr old/pre-pubescent, like “Oh my GOD, he’s sooooooooooooo cute” set, force yourself to accomplish endurance tests that aren’t necessary and receive a qualification that would only be good if I suddenly decided to change careers, channel by inner Baywatch star and become a lifeguard? 1) Because I had quit…when I was a kid and it really has lurked in the back of my mind for this many years and I wanted to show my kids that regardless of the time it takes, it’s always worth finishing what you started. 3) Because I have this silly list…a plan of things I was going to scratch off before I hit 40..it’s not 40 that’s the issue (at one time, I wasn’t sure I would get past 29 with the kind of adventures I was having!) It’s the list..Of things I really want to do…to take life fully by the horns and live every day as fully as I can. I have scratched a few so far- motorcycle license, bungee jumping, zip lining, parasailing, scuba diving, surfing, Italy, Spain and as of yesterday, my Bronze Medallion. The catch is, I have a TON more on my list and find with having kids that my nerves of steel are starting to get a lot more like rubber..torn between making smart decisions that won’t put any of us at risk, and wanting to lead by example to my children to go for the adventure, do something that scares you every day, take the bull by the horns. I want them to go after what they want. To work hard and reap the rewards. To never believe that they can’t do something. If I can get that through to them, it’s one of the most important lessons I can pass on. I’m not sure which adventure the list will take me next but I can honestly say…its something already starting to percolate in my head. Want to know what daily life is like with Autism?